After drawing Oprah Winfrey to finish off 1997, a portrait she gave to her father for Christmas, Michael followed that in 1998 by doing portraits for Harrison Ford, Senator John Glenn, Gregory Peck and Joan Fontaine. 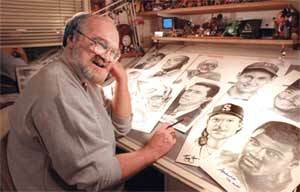 He also completed his first charity lithograph for the Richard Karn/Fred Hutchinson Cancer Research "Star days". This litho was sold as a fund raiser art piece and included images of 30 separate celebrities. Michael is also member of the steering committee of this foundation. In addition to these projects, Michael was appointed Director of Trademarks and Licensing for the University of Washington. He was also chosen to be the artist that designed the new Husky dog logo seen on many of the Husky products. For one of the Northwest's premier artists, 1998 was a year which brought Michael a step closer to his lifelong goals. Thirty years ago, however, Michael could never have imagined such a picture. A Seattle native, Mike grew up in several area neighborhoods and graduated from Lincoln High School in 1965. After a football injury forced him from the weekend sandlot football gridiron, Mike drew his first significant portrait of Katherine Hepburn. A family friend was so impressed, he encouraged Mike to pursue a career as an artist. That was all he needed to hear. That friend's encouragement helped Mike keep his dream alive, even while living the daily nightmare of the Vietnam War. When not coping with the darkness of war, he spent his free time drawing portraits of friends, or relatives of friends. With each portrait, Mike honed his skills, specially his pencil technique. Some of these pieces were the last images the families had of their loved ones. Returning from Vietnam in one piece meant having to adjust to civilian life. After driving a truck and selling furniture for a living, Mike entered the Burnley School of Professional Art (now the Art Institute). He landed a job with the Seattle School District in 1974, where he worked as a computer programmer. Mike's interest in art intensified, reaching a peak when he met actor Van Johnson backstage during a stage performance in Seattle. The pair hit it off and because of Mr. Johnson's gracious treatment of Mike's guests, Mike drew a pencil sketch of the star and personally presented it to him as a symbol of gratitude. Mr. Johnson was ecstatic and told Cirque Theater owner Gene Keene, about the gesture. Mike convinced Keene to let him do portraits of all the celebrities during performances at the theater. Compiling sixty-two drawings over a five year span, this arrangement lasted until the venue closed in 1981. Unfortunately the drawings were lost with the business. Undaunted Mike contacted celebrity agents he had met during that period and requested press photographs of their clients. Mike would then create two identical portraits of the star, then present them to the celebrity with the request that the other be signed and returned to him. Today, over fifteen hundred of these portraits are in Mike's collection. A small sampling includes: Pope Paul, former Presidents Reagan, Carter, Ford, Nixon, and Bush, and their first ladies; Bob Hope, Red Skelton, George Burns and Ingrid Bergman. Mike has drawn all the Heisman Trophy winners; most of the NFL Hall of Fame inductees; along with Mickey Mantle, Joe DiMaggio,Nolan Ryan and Mark Maguire. Meanwhile, Mike's reputation and works are now being recognizes internationally. The collection has grown in another way. The celebrities Mike draw's now sign multiple blank illustration boards. Once Mike gets those signed boards returned to him, he redraws their celebrities portrait and donates it to charity. Over the last ten years Mike's portraits for charity alone are responsible for raising $10,000,000 nationally. Mike once said to a reporter, "I've been given a gift. I hope I'm doing what I'm supposed to with it." There are a lot of people that believe he is and thankful for that. In 1995 Mike began giving motivational talks through the University Speakers Bureau. The title of his talk is "Keeping your dreams alive". Mike believes that personal communication with young people will show them that success is a state of mind. So many time people think success is luck. Mike doesn't believe that, success is earned. Mike also loves sports. He is doing or has done major artwork for most of the sport's teams in the State of Washington. "Its interesting being a Husky and being asked to do Cougar artwork." During the 90's Mike had around 1,200,00 sports posters in circulation in the Northwest. Michael is available to do a portrait of your significant family members or friends.